THIS REVIEW OF ‘THESE SAVAGE SHORES’ #3 IS SPOILER-FREE. by Mickey Rivera. 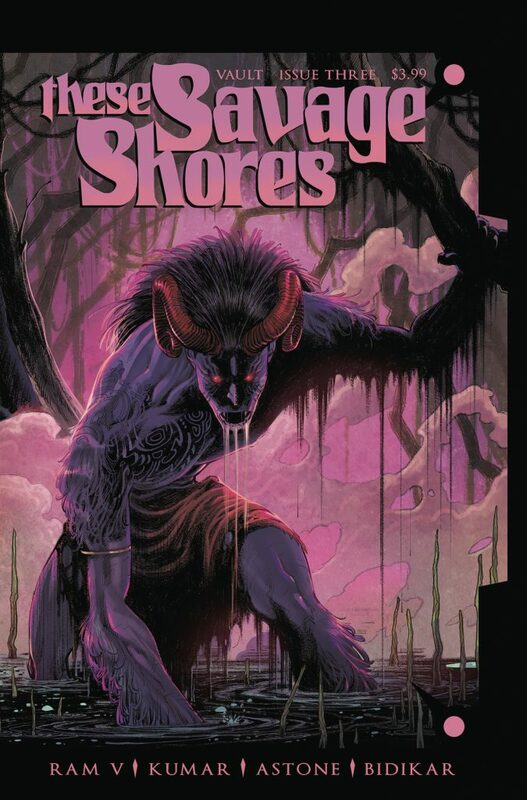 These Savage Shores is shaping up to be one of the best horror comics money can buy at the moment, and this third issue cements that notion with a heartbreaking and brutal ending that demands further reading. To call it “horror” may be oversimplifying things; this book pulls in elements of historical fiction, romance, and ancient mythology of both European and Indian origin. We have so far been presented with two competing folkloric demons: The European vampire and the Indian asura. Writer Ram V has dreamed these beings into two representatives of warring cultures, those being the empire-hungry British and the beleaguered Kingdoms of India. As The British East India Company uses politics and firepower to expand its trade in India, the Princes and Kings of India must protect their way of life from total subjugation. Ram V’s storytelling is supremely engaging. His penchant for epistolary exposition gives him, and by extension, his story, certain storytelling privileges; long stretches of monologue allow space for various characters to speak out their fears, loves, and hatreds. Every character has a lot to say about themselves and the world around them—each is so palpably different from the other that I could imagine having a personal conversation with each one and know fairly well how it would go. It’s not just his characters that are well rounded, either; despite technically being a pulp soap about vampires and demons, the fantastical elements of These Savage Shores weave beautifully with the shocking real-life history of the East India Company and their many evil deeds. The balance between exceptional writing and the relaxed formalism of the art team—consisting of Sumit Kumar on pen and ink, Vittorio Astone on colors, and Aditya Bidikar on letters—is what makes this series such a home-run. Together they give the book an stylized storybook quality, with enough detail to ground it in a tangible way. It would be a precarious balance but for this creative team. These Savage Shores is an amalgamation of the wind-swept British gothic novel and Indian mythology. Here we have a combined tale of horror and romance that speaks somewhat to the usually unstated imperialistic reality in which those stories existed, but mainly to the experience of the allegedly conquered. Ram V is clear about the warmaking spirit that lived in both British and Indian societies at the time, but emphasizes the difference between war for survival and war for profit, and this difference provides this month’s issue a proverbial gut-kick. As readers will see, this installment ends with swift and brutal carnage. As it must. Panel by panel, page by page, These Savage Shores flows forth carrying shiny fragments of written history on its surface. Using the combined blood and honor of disparate cultures, this story illuminates the brutality and romance of a shared past. Plainly: It’s an amazing story, and it’s only going to get deeper, better, bloodier.